Summary: One of the major downsides to travelling is keeping your camera gear safe. These tips and tricks will help counter this nuance so you don’t end up leaving a trip with a broken memory. If there’s a “must-have” item that you need to bring for travel, it’s a camera. Now, it doesn’t matter whether it’s a DSLR, video camera, or even your casual smartphone, there’s no better way to capture the spirit of adventure than by pointing and shooting. But, travelling often involves putting your camera at the heart of danger, whether it’s water, sand, and humidity. You’ll obviously have an agenda for your trip, and chances are you’ll want to bring your camera with you so you can preserve those precious memories forever. 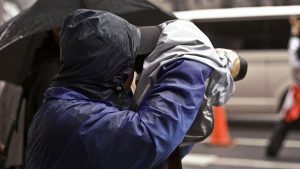 A broken camera won’t do you any good, so here are some tips and tricks to protect your camera gear from the elements. No one can predict the rain. It comes and goes as it pleases. Some standard cameras are waterproof, but for the rest of the models, you’ll need to be mindful and careful. There are a wide variety of rain covers for all types of cameras that come in all shapes and sizes. It’s worth the price tag if you’re a serious photographer. Most expensive camera bags tend to hug onto the shape of the camera, leaving little room for it to wiggle around. However, there are some bags that are built in an awkward fashion, forcing you to be extra careful with it so you don’t shatter your camera with a drop of the bag. A great way to counter this is to stuff it with lightweight fluffing like foam. While it may sound silly, placing some foam inside of your camera bag can actually increase the amount of shock damage it can take before actually harming the camera itself. Additionally, it’ll root your camera in place and ensure that it doesn’t bounce all over the place while you’re walking around. Blog submitted by The Foam Factory: For premium foam products such as flexible polyurethane foam, foam inserts, and other quality foam materials, visit the experts at The Foam Factory today.